Tentworld: NEW!! Companion Aqua Cube Logic ! Just out! NEW!! Companion Aqua Cube Logic ! Just out! JUST OUT! The new Companion Aqua Cube Logic will be hitting the Tentworld shelves in the next few days. I have been fortunate enough to have a brief play with the new Companion Hot Water System delivered to us by Primus Australia. This hot water system designed specifically for campers is awesome. Quick video showing the Companion Aquacube setup and in action! It is simple to use and has a digital control panel which provides read outs for water temperature both entering and exiting the system. It features two water outlets one for showers, and the other for the basin. Where the water comes from is controlled via a button on the front of the unit. Water cannot come from both the sink and shower outlet simultaneously however, but it does open up a lot of exciting possibilities! Especially for those looking for a great economic hot water solution for their camper trailers. Allowing home modders to plumb in their own hot water sink and shower. Video: Unboxing the Companion Aqua Cube Logic. 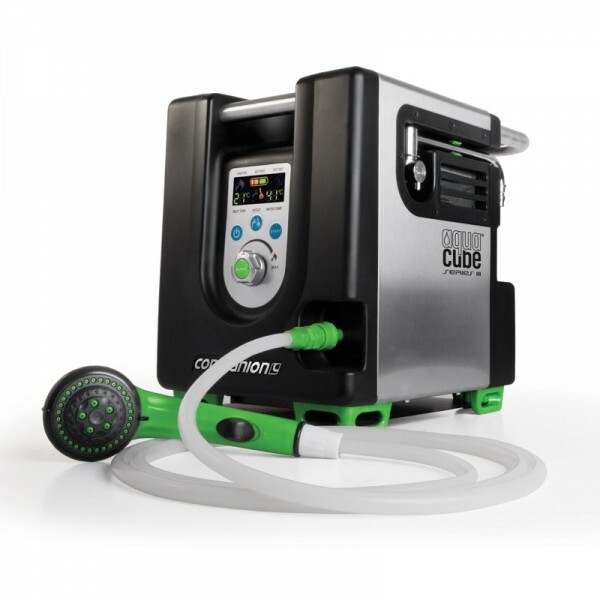 This unit also has its own built in rechargeable power source making it extremely portable! However, the biggest seperator here is that it can operate whilst being recharged! No more being caught out if your battery is flat! That being said, the unit will operate for around 40 minutes on a single charge. Stacks of hot water when you're in the bush! The Companion Aqua Cube Logic, is by far the most technically superior hot water camping system on the market today and will make many campers extremely happy!